From the impact and cult success of the 2004 debut album Reality Dysfunction by Linear Sphere, comes the long awaited second album Manvantara, due for release on July 7th 2012. Recorded and produced by Martin Goulding, mixed by Martin and John Papas at Hardbeat Studio in Wembley, North-West London and mastered by renowned engineer Alan Douches, and with special guest and top British actor Paul Darrow (Blake 7) narrating on the third track Cycle of Ages. The album is heavily progressive with rock/metal/fusion/experimental influences and features Jos Geron on Vocals, Martin Goulding on guitars, Jamie Brooks on keyboards, Steve Woodcock on bass and chapman stick and Nick Lowczowski on drums. Manvantara is a concept album for the times, with a story starting in ancient Atlantis, and with mankind’s journey traced from the golden ages of enlightenment with man living in accordance with nature and the law of one, gradually moving away from his spiritual source to an age of exploitation, greed, corruption and decline, infiltrated and guided by dark and ancient otherworldly forces. Rock! 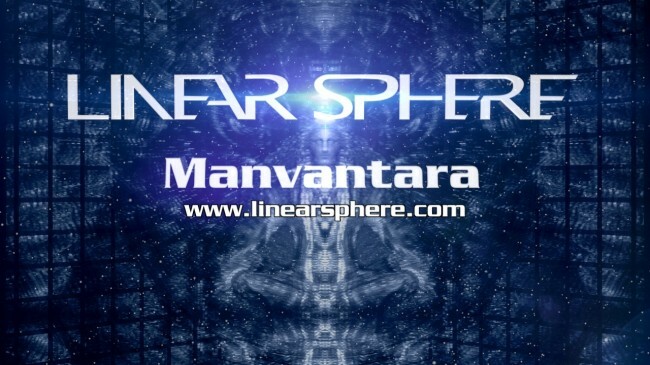 With bespoke artwork by Ashley Christudason at Jungle Eye, and a progressive-metal-fusion concept album of epic proportions, Linear Sphere are very pleased to announce the release of Manvantara, available from our webstore as a CD complete with 12 page booklet from July 7th 2012, and available digitally through ReverbNation, iTunes and Amazon from summer 2012. This entry was posted on Saturday, June 23rd, 2012 at 1:11 am	and is filed under News. You can leave a response, or trackback from your own site.